The week started off dry and warm early on the 3rd, but a weak storm impacted the area overnight into the 4th. It brought 4-5 inches of snow (.6” of SWE at Schofield Pass). 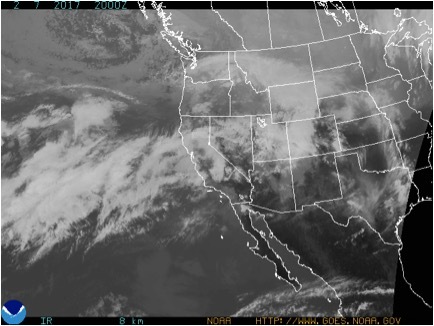 Southwest winds were blowing strong during the storm with gusts up to 64 mph on the 3rd at 11,000 ft. February 5th offered a brief pause in the storminess with few clouds in the sky and temps rising to 34F at 11,000 ft.
2/3/17 – Satellite image showing the weak first storm of the week affecting Colorado. A stronger, warm and wet winter storm began to affect our area on February 6th and lasted into the 8th. 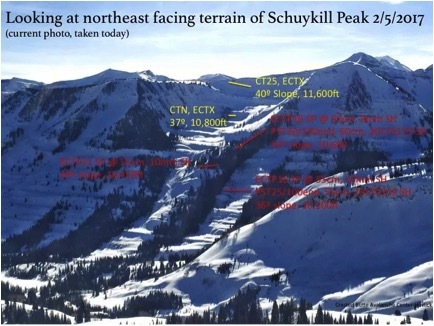 Over the course of the storm, Schofield pass picked up 1.7” of SWE and 11” of snow, Mount Crested Butte recorded 1.9” of SWE and 11” of snow, and Irwin received 20” of snow. Much of the snow consisted of graupel at lower elevations. The storm brought with it strong winds out of the west, averaging 23 mph and gusting up to 89 mph on the 7th at 11,000 ft. The storm slowly subsided during the day on the 8th and by the 9th skies were scattered and temperatures were skyrocketing. Billy Barr’s weather station in Gothic recorded a record high for the day of 47F. 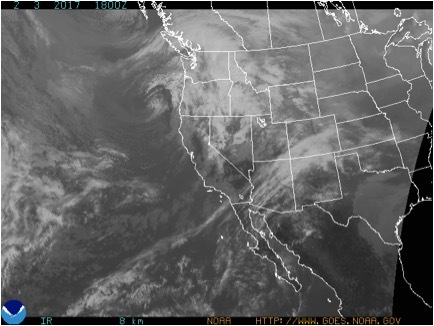 2/7/17 – Satellite image showing the stronger second storm of the week impacting Colorado. The beginning of the week continued the trend of slowly stabilizing persistent slabs on the 1/19 surface hoar layer. Persistent slab instabilities were becoming increasingly isolated and stubborn, but also consequentially dense and 1-3 feet thick. On the 4th, a persistent slab on the 1/19 surface hoar layer was skier triggered in the neighboring Aspen zone. 2/4/17 – Skier triggered persistent slab avalanche running on the 1/19 surface hoar layer in the neighboring Aspen Zone. 2/5/17- Pit results showing the spatial variability of the buried surface hoar problem. Wind slabs on leeward aspects above tree line were added to the problem list on the 4th due to the strong winds of the first storm of the week. 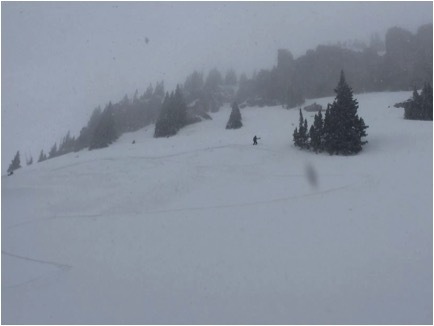 But with only meager storm totals during that first storm, the wind slabs remained small until the second storm of the week. These wind slabs became larger and more widespread with the second storm. 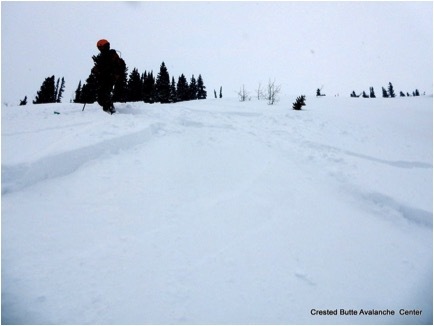 Numerous natural and skier triggered (here, here, here, and here) wind slab avalanches were observed. The second concern with this loading event was increasing sensitivity of the buried surface hoar layer resulting in large persistent slab avalanches. Northerly and easterly aspects near and below tree line remained the most suspect slopes for the dangerous surface hoar layer. A few skier triggered persistent slabs on surface hoar were observed after the second storm. 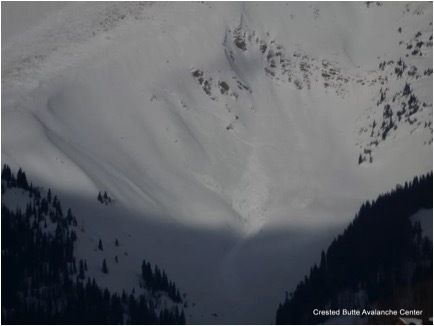 With the record warmth on the 9th, wet loose avalanches were added to the problem list and were observed on steep slopes around the compass, especially below tree line. 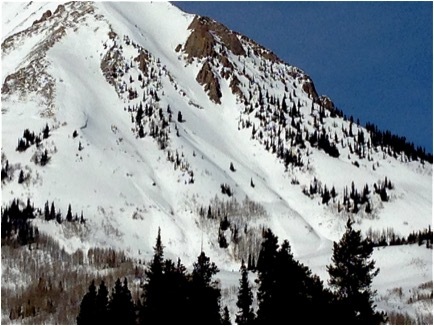 A very large avalanche also ran naturally off of Gothic Mountain on the 9th. 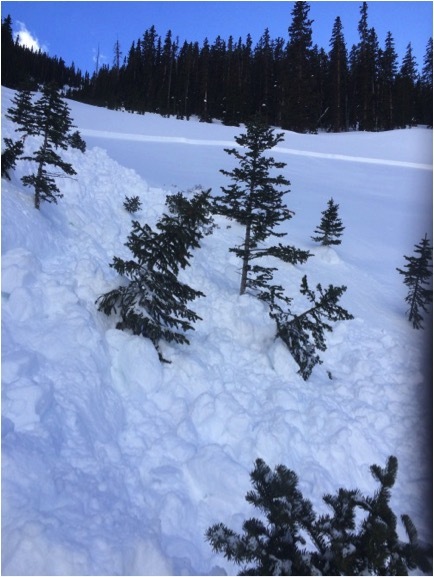 2/7/17 – Skier triggered wind slab on a SE aspect near tree line. 2/7/17 – Skier triggered wind slab. 2/8/17 – Natural D2 wind slab on a SE aspect of White Mountain. 2/9/17 – Natural wet loose avalanches on a south aspect of Gothic Mountain.